Sometimes you can’t see the wood for the trees, but in this case I nearly couldn’t see the trees for the weeds! 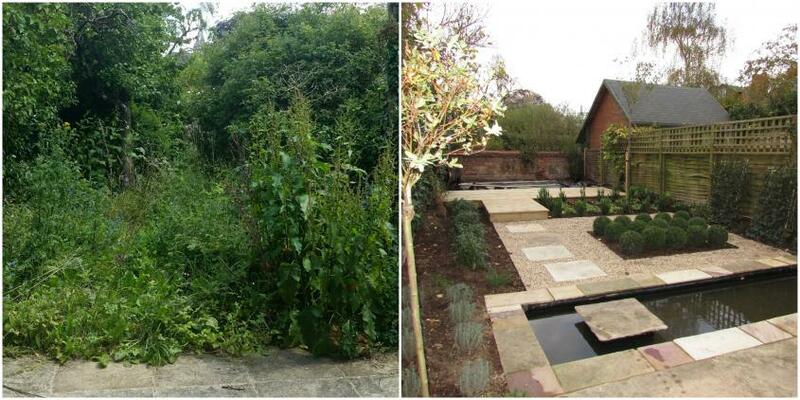 This small back garden in the centre of Oxford had been neglected for several years by previous owners, and then had to wait its turn till the house extension was completed by the new owner. Now there is a really great extension, with floor to ceiling glazed doors opening out onto the garden and as a result the garden is suddenly on display. Not a pretty sight to look onto to see a tangled mass of waist high weeds! The brief from the client was to keep everything low maintenance, mathematical and peaceful, with the inclusion of water in some form or another, as the aquatic world played an important role in the form of diving as a hobby. At the end of the garden there will soon be a contemporary garden office installed, so part of the brief was for the view to be considered from both the house and what will be the garden office. Lastly the client was interested in having a mixture of hard surfaces, so no lawn, but a play on a variety of surfaces. To this end I designed a water feature where the water itself becomes a surface to walk through. Whilst lots of people think that topiary is high maintenance, if you have a small garden and therefore no room for avenues lined with topiary (which do take up a lot of time), it can be just the ticket to add structure and shape to your small garden without too much work. To maintain these box balls (buxus sempervirens) will only take twice yearly cuts. Box is tough and undemanding and can withstand sun or shade, and most soil types. They don’t like to have their feet permanently in water, though I have planted box in a garden that flooded yearly, but only for a week or two, and they have flourished despite the annual soaking. It can be very therapeutic pruning these lovely balls back into shape, however if that sounds like too much hard work, then it is a simple job for a professional to do twice a year. When is the best time to prune? I think at the end of Spring, so around the end of May, and the end of Summer, so around the end of August. As always in gardening you need to pay attention to the weather that year, so these dates can be revised depending on the length of the season. A garden like this will be on view all the year around, so it’s a good idea to include more evergreens that you might ordinarily use. There are lots of wonderful evergreens available to choose from, and I like to think about the shape and colour of the leaf, alongside the more obvious shape and height of the shrub or perennial itself. Then there are the flowers to consider. Not just the colour, but when do they flower and for how long? In a small garden each plant has to really earn its keep, so both length of flowering time and choosing plants that will give you a succession of flowering seasons, is key to changing the picture for the viewer as the year progresses. And finally there are fruit or berries. Some shrubs give you two bursts of colour, first when they flower and then when they fruit. One of the selections in this design is Skimmia japonica Nymans, which bears beautiful, bright red berries in the Autumn/Winter. In order to achieve this feat though it needs a male counterpart, so plant a male Skimmia within pollinating range. In this instance we chose Skimmia Kew Green to complete the picture. One of the main differences between garden design and interior design, is that in a garden you need to create the third dimension, or the ceiling of the room. In this garden we chose the beautiful Prunus subhirtella Autumnalis Alba, which once it grows up a bit, will give that much needed third dimension. This variety of Prunus will flower intermittently from November through to March, a season when there is very little else in flower. Then once the Spring is sprung it will form an upright crown of green leaves, which turn a beautiful yellow in the Autumn. It is very adaptable, happy in any soil, any aspect or exposure and grows to a spread of about 4-5 m which makes it a great choice for small gardens. This winter wonder has been awarded the RHS AGM award. Here is a picture of what it will look like in the years to come.